Have you found a profitable product, but the product listing is in disarray? Sometimes you just have a good feeling about a product, and even though the rank is disgustingly high you feel like you can get sales. I often get this feeling when I see a product, especially in one of my wheelhouse niches, and the Amazon listing looks like it was created during a hurricane. Seriously, if you have a good feeling about a product, but it is lacking in rank, a bit of a clean up to the listing can go a long way. 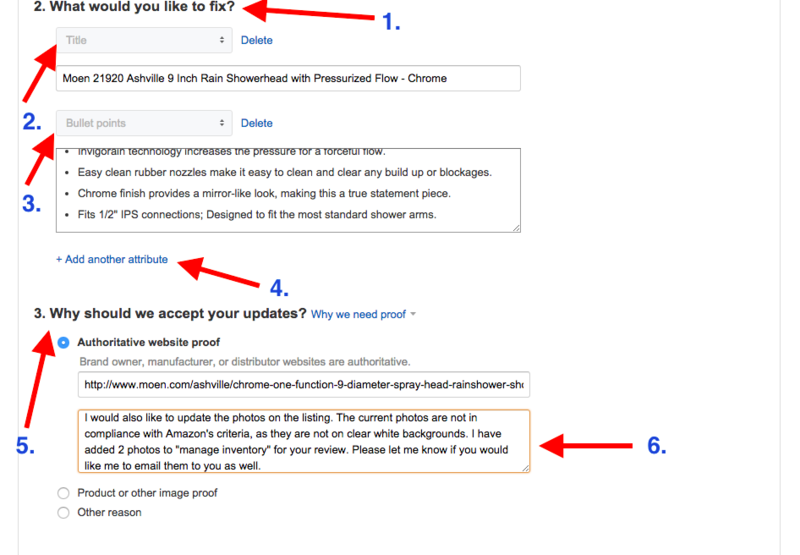 Here we’ll cover the two ways you can update an Amazon listing without using one of those cumbersome and often overwhelming flat files. And yes, I took a 500K Rank to a 50K rank by using this technique. So you’ve looked at the “vitals” and see that it’s a very profitable item, yielding $15.65/unit and 72.45% ROI. However, the rank is dreadful. 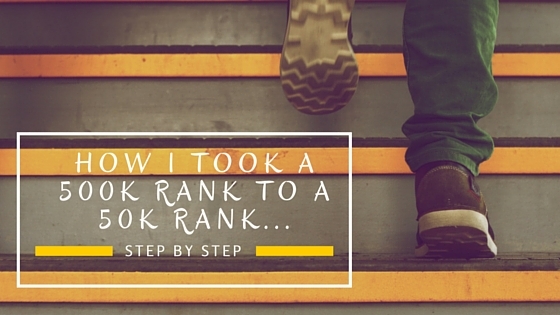 But ranks change, especially if you spruce up the listing. Let’s look at the areas that we can improve upon. 1) Title – Although the title isn’t too shabby, there are some items that need to be addressed. For one, the first 4 words in the title have the MOST impact on your product listing. And I highly doubt that “2.5” and “GPM” is something that customers are primarily searching. Instead, we’ll use more powerful keywords that get more traffic. Last thing, the collection “Telford” is wrong as it’s clearly written Ashville on the product, HomeDepot.com and Moen.com. We’ll change that too. 2-3) Pricing – You can see that we are in the Buy Box at $79.95 and Amazon isn’t with a price of $49.98. Why? That’s because they are temporarily out of stock and I’ll try and strike a higher price while I can. But from what it looks like, this product isn’t moving so we’ll need to be more in line with Amazon’s price, in addition to updating this listing. 4) Bullet Points – These are some painfully vague bullet points. They could apply to almost any Moen listing. We want to give customers selling points and use terms that will drive traffic, so don’t be lazy here. 5) Photos – When I see photos like these it makes me cringe. Amazon customers shop on Amazon because they get the best marketplace experience, with great pricing and quality products. The photos in this listing are very representative of an eBay listing and if they wanted a product from eBay, they would, well, be shopping on eBay. So, we’ll have to snag some manufacturer photos from Moen.com. Last thing here is that the photos aren’t even compliant, as the main image needs to be on a clear white background without any packaging. 6) Product Description – Let’s not forget this one. Although it’s below the fold, it’s there for a reason. That is, to offer additional information for those who want some more in depth details. And while there is a little information already provided, more is better. Now that we’ve identified areas to improve on the product listing, it is time to make edits. And this can be done in two places. Let’s start with Option 1. 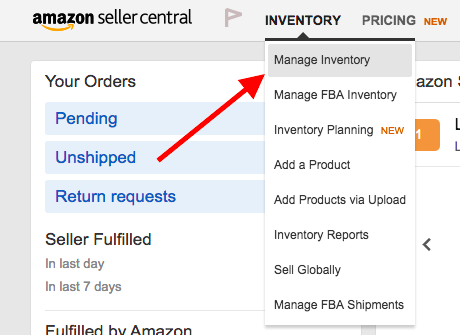 From your seller dashboard, click on “manage inventory” under the “inventory” tab. Then, you will need to search for the product listing you want to edit. Once you pinpoint it, click on “edit” from the drop down on the right of the screen. From this page, you will not only have the ability to add new product images, but you can request to change the title, bullet points, product description, etc. In this section you’ll be able to update the title, manufacturer, brand name, etc. When creating your title, you can use tools like Merchant Words, Terapeak or just as easily use the Amazon search bar. These will all help you to pinpoint what terms customers are searching for. 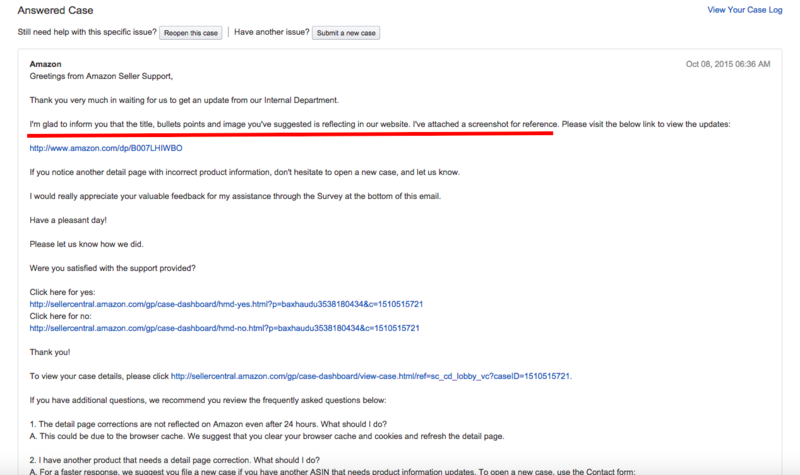 Once your title is written, make sure that it is in compliance with Amazon’s guidelines. For example, you can only use 50 characters in the Home Improvement category, so make sure it is short and sweet. 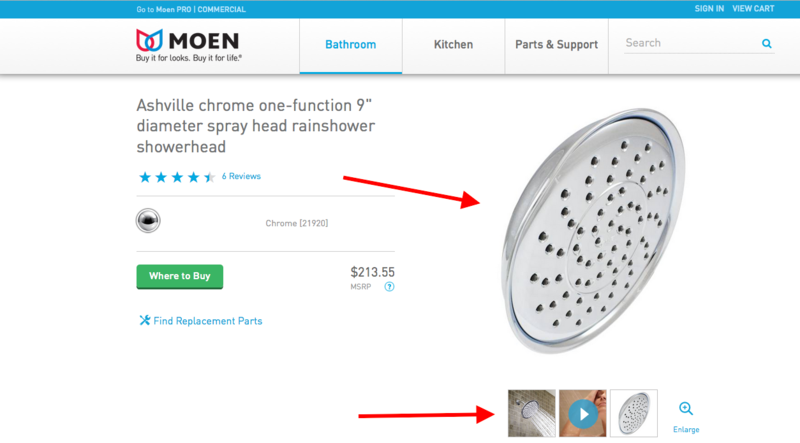 Since this is a Moen product, I went to their website, found this product and saved the images to my desktop. Although it doesn’t matter in this case, keep in mind that ONLY the images that you add here will be added to the product listing. If they aren’t shown in this upload section, then they won’t appear on the product listing. Basically, if these attached photos get added, it will delete/replace all of the current photos. You can refer to Product images style guideline for more details on images. Click on “description” at the top of the page to edit your bullet points. Again, you won’t see the bullet points that are already on the product page (unless you created the listing), so if you want to keep some you need to add them onto this page. Otherwise, Amazon is ONLY going to use the ones that you add. While here, you can also update the Product Description. Now that we have our Vital Info, Product Images, Bullet Points and Product Description revised, it’s time to save and finish. From here it’s just a matter of Amazon updating the product listing. But like I said earlier, if you did not create this product listing, it is hit or miss if this will work. So, if you’re not the creator, Option 2 is where you’ll want to focus your time. This option is much faster, and is where you’ll be able to follow up on the status of your updates or simply revise content if you’re not the original listing creator. 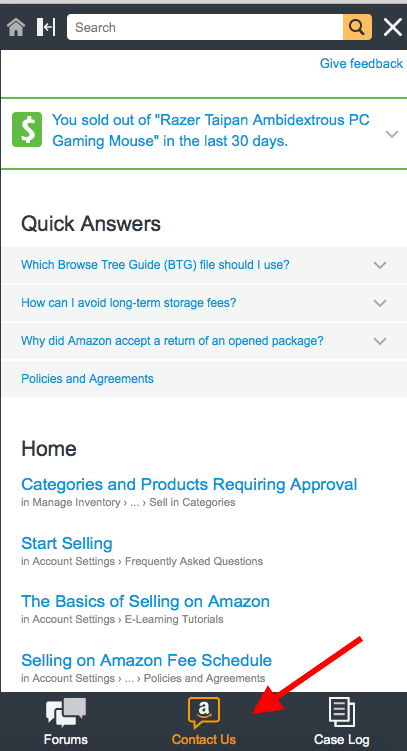 From your seller’s dashboard, click on “help” at the top right of the page. Time to select the reason for contacting seller support, and then add in your edits. Since I’m impatient, I check the status often instead of just waiting to get an email. Once it says answered, it’s time for the verdict. Will they edit the listing, or won’t they? Or maybe they just need some more information. Let’s see what happens here. Look at that! Our request has been approved and processed. I will note, that when I updated the product listing using Option 1, I did not get any results. That’s because I, again, did not create the listing. So, it’s just a matter of knowing which option to use and what information to provide. Let’s take a look at what the listing looks like now. Not too shabby. Got the images, title and bullet points updated. Now, let’s see if this new, optimized product listing will spike sales and therefore the rank. Hey now! That should go to show you how volatile rank is. I mean, it went from 400K+ to 58K with just 2 sales. Yes, of course you could speculate and say that these sales were attributed to the product being back at the “market price,” but I look at listings as a whole. I strongly believe that this product was not moving AT ALL, and the condition of the listing was a major factor, not just the inflated price. Regardless, whether you have a product that isn’t moving or you just have that “gut” feeling about a potential buy, just know that you have the ability to improve that listing to boost sales and make mama proud!